Here is how I made those flower petals. This is the method I worked out. Someone else may know a better way. 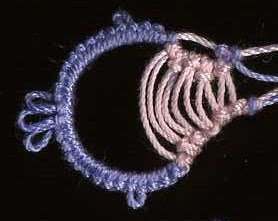 First, wrap the thread around your hand, but instead of bringing it into the pinch as for a ring, bring the thread over the index finger and then into the pinch. This is the color that will show on the outer part of the petals. I used two shuttles, but perhaps this one could actually be a ball thread. You will hold this thread in place while weaving the other shuttle around it, so it feels a little like a cluny. Perhaps you could make a loom to hold the thread just like you do to avoid those cluny hand cramps. Next, with the other shuttle, make an unflipped stitch around the left thread. (I had to make a few repeats before I could get a good photo.) 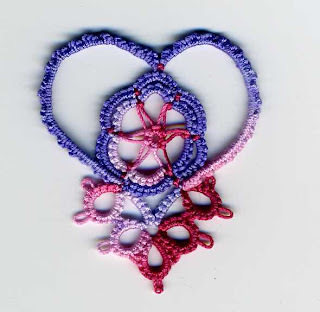 If you are trying for one-sided/front-sided tatting appearance, make the halves of the stitch in reverse order. Then make an unflipped stitch around the right thread. 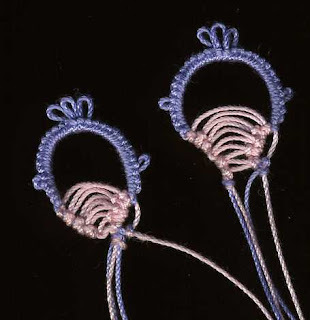 Repeat back and forth, with the first stitches very close together, and then leaving more thread between sides as the V shape widens. Once you have made enough repeats back and forth, end with a stitch on the left side. (Yes, that's an uneven number of stitches, but it works easier for me to start on the left.) Tension the stitiches so that they lie close together, and then begin making regular flipped stitches for the chain across the top of the petal. Once you have enough stitches, tug this shuttle to tension the chain, then take the work off your hand and pull on the other shuttle to close the loop. 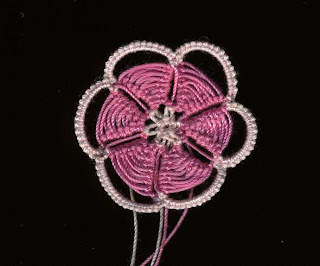 Then make one more stitch to bring the core thread down to the base of the petal. 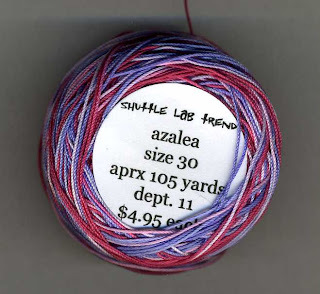 With the blue and gold threads, I had switched shuttles to make this stitch and with the pink and purple I did not. I'm not sure which way is best, though you would need to do it the second way if you were using a ball thread instead of two shuttles. 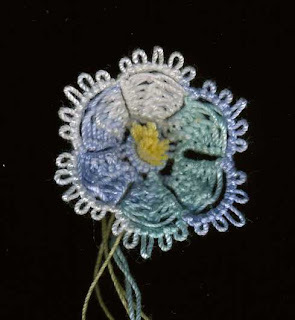 I think this little flower is the same technique that Gina showed on her blog yesterday. At the Palmetto Tat Days last month, Riet had a pattern sheet in Danish showing this and sort of challenged me to figure it out. Well, I love a challenge. Below are a few single petals I worked that day as practice. I meant to go back and do some more sometime, but forgot about it until I saw Gina's post. Then I just had to try it again and worked the little motif above. I'll tell you how soon, but not enough time right now. Here is a similar effect, but totally different technique. 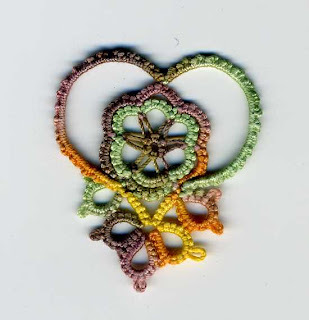 This is the flower from Erin's Herringbone Hookup class, also at Palmetto last month. And while I'm thinking of it, this is the project from Riet's Palmetto Night Owl class. 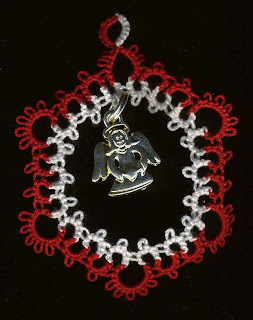 The pattern was designed for an earring, but I used a larger thread to make it a Christmas ornament instead. By the way, this was a great technique. I already know how to get this effect with reverse work, shoe lace tie and switch shuttles, but Riet's way does the same thing so much faster without having to do all those things. I even finished this project that night. I liked it so well, I made it again, this time with Shuttle Lab Trends HDT, another gift at Palmetto. They sell it by the ball in the vending room there, but I don't know where else you can buy it. Another nice thread, and lovely colors. 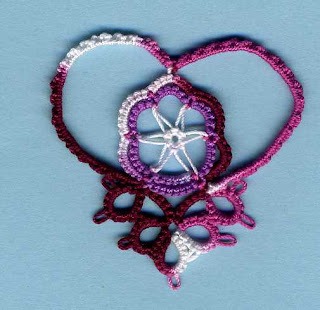 This is the same heart again, this one made for me by Tatting Chic, using a Yarnplayer HDT. 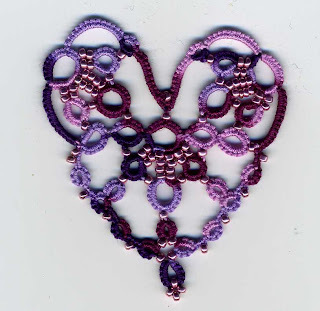 And here is another gift, a Jane Eborall pattern made by Sherry Townsend. I think this is a Lizbeth thread. 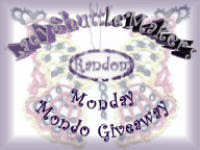 Don't the beads go well with the thread? BTW, over the next weeks (months?) I will trying to sell assorted knit, crochet, cross stitch, quilting, etc books and magazines on ebay. Some of mine, some of my mom's. It's been a long time since I sold on ebay, so I'm having an uphill battle re-learning how. My seller name is esstats.